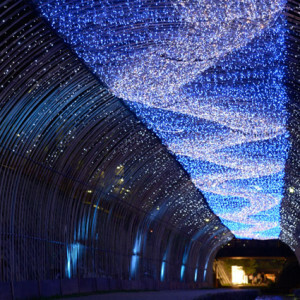 One of Japan’s most important festivals revives a tradition that has been dormant for decades. Since being brought into the spotlight last year by Tokyo 2020 Olympic bid ambassador Christel Takigawa, omotenashi continues to be one of the most popular words in Japan. Of course, this supremely Japanese concept of unobtrusive hospitality is nothing new: it is a dynamic that can be felt in the relationship between staff and customer almost anywhere you go. In fact, the importance of omotenashi is something that even the gods need. This was on the mind of the ancient emperor Seiwa who, in the 9th century, declared that the gods were in need of some attention, following a severe plague that had struck the city. The emperor required the people of Kyoto to pay impressive respects to the resident gods of the Yasaka shrine, located in the well-known entertainment district of Gion. In addition to the mikoshi or portable shrines—hallmarks of Japan’s religious festivals that serve as temporary containers for the gods themselves—66 decorated halberds were created for the occasion. Whether the gods truly appreciated the ritual or not, the intensity of the outbreak abated, leading the people of Kyoto to hold the festival any time that the plague struck the city again. But within a century, the leaders of the city had decided that the Gion Matsuri should become an annual affair—the festival had become popular among both the human and the divine. Over the years, Gion Matsuri became more and more extravagant: the halberds were replaced with huge floats, called hoko, and smaller floats called yama joined the procession of the mikoshi, as they travel first to their temporary home for the duration of the festival, then to a purifying bath in the Kamo River, and finally back to the Yasaka Shrine. The tallest yamahoko can measure 8 meters from the bottom of the wheel to the halberd’s tip. Collectively known as the yamahoko, these floats display a level of craftsmanship that is unparalleled for festival arts in Japan, earning them a place among UNESCO’s Representative List of the Intangible Cultural Heritage of Humanity. The yamahoko started to develop into impressive structures during the Medieval Period, but it was the wealth of the Edo Period merchants who lived in the area that transformed these floats into the giant vessels that navigate their course through the streets of Gion today. 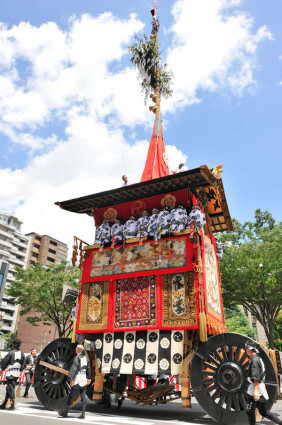 Accompanied by dozens of attendants, the yamahoko are impressive to behold, standing a total height of 6 to 8 meters above the crowds that gather for the procession, with wheels that roll nearly 2 meters high. The yamaboko stand out not only for their sheer size, but also the splendor of their decorations and design. Each float features a different theme, from Buddhist and Shinto deities and prominent figures in Kyoto’s history to animals and celestial bodies. Colors abound as the massive floats make their way through Gion, and each one has a unique style that has been developed over generations. Most of the decorative handicraft that goes into festooning the yamahoko are of Japanese origin, but many items found on the floats come from other countries, and this is a little-known international element of this eminently Japanese event. During periods when trade with other nations was booming, carpets from the Middle East, silks from China, and textiles from India and Europe all made their way onto the floats. As these pieces wore down over time, the artisans who worked on the yamahoko learned how to restore these objects themselves, and in so doing, found themselves maintaining craft making traditions that had died out in the lands where the objects originally came from. 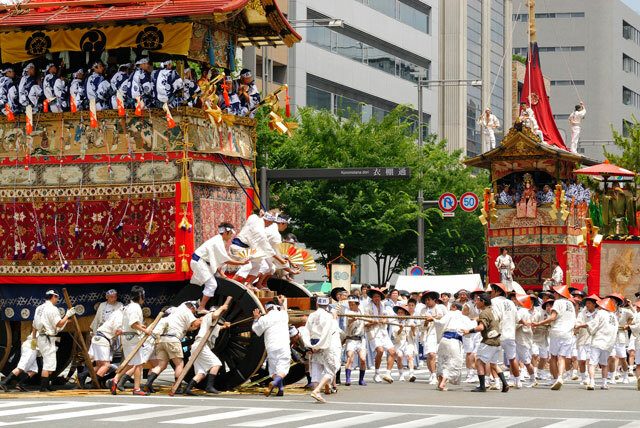 In the early days of the Gion Matsuri, the main processions of the festival were held during the sixth lunar month on Japan’s ancient calendar, but along with the increase of the size and scale of the floats, the festival’s events expanded over time, and now as it is celebrated, Kyoto celebrates Gion Matsuri during the entire month of July. It begins with the opening ceremonies held in Gion’s various neighborhoods and the lottery that will decide the order of the floats in the procession, peaks during the first procession of the yamahoko and the parading of the mikoshi to their temporary home on Shijo Street, and closes with the final procession of the mikoshi back to Yasaka Shrine and the last ceremony on July 31. Throughout the festival, the streets of Gion take on a new life as they fill with food and craft stands, making each night more festive than the ones before it. Aside from the days of the yamahoko procession—July 17 and 24—some of the most impressive sights can be seen on the three days immediately leading up to the processions. On these days, known as yoiyama, the already lively atmosphere rises to another level: cars are not allowed on the streets of Gion for the runup, and you can expect to see even more people walking about, many dressed in colorful yukata. This is also the time when many of the shops and homes in the Shinmachi and Muromachi neighborhoods open their doors and display some their most prized objects. At one door, it might be a centuries-old piece of hanging calligraphy, a ceramic piece made by a celebrated master, or a painted folding screen, from which this particular tradition takes its name: Byobu Matsuri, or the Festival of Folding Screens. At many of the houses, visitors are welcome to come inside and take the rare opportunity to see the interior of a traditional Kyoto house first hand. 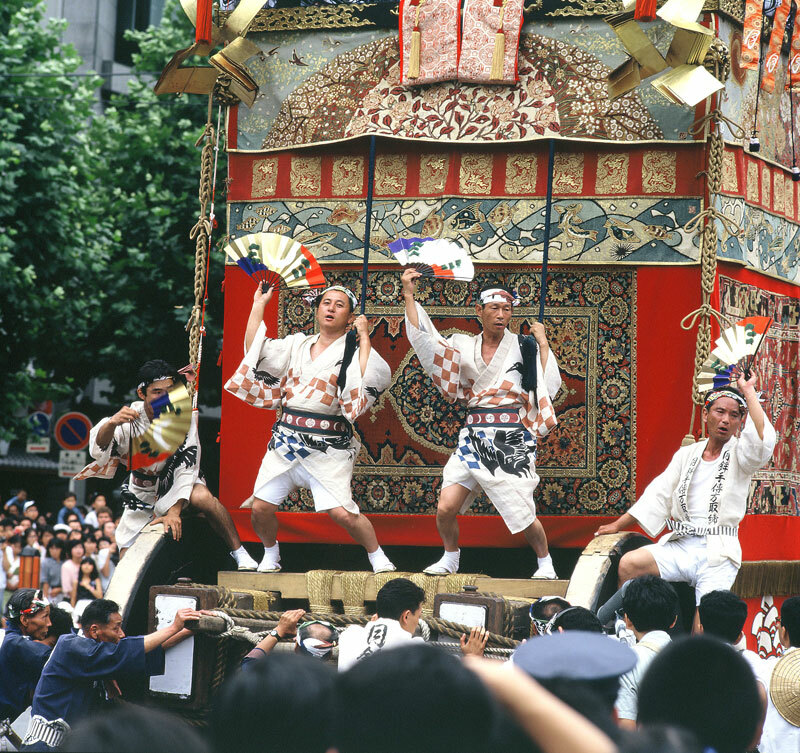 Traditionally, there have been two yamahoko processions: one to accompany the mikoshi leaving the shrine (the sakimatsuri, or first festival), and one to accompany their return (the atomatsuri, or second festival). However, in the years following World War II, economic development took precedence. Stopping traffic for another three or four days would have put the brakes on Japan’s booming businesses, and the yamahoko was held to just one day. This year, the people of Kyoto have chosen to make a return to two separate processions, in keeping with the idea of making sure that the gods are happy. 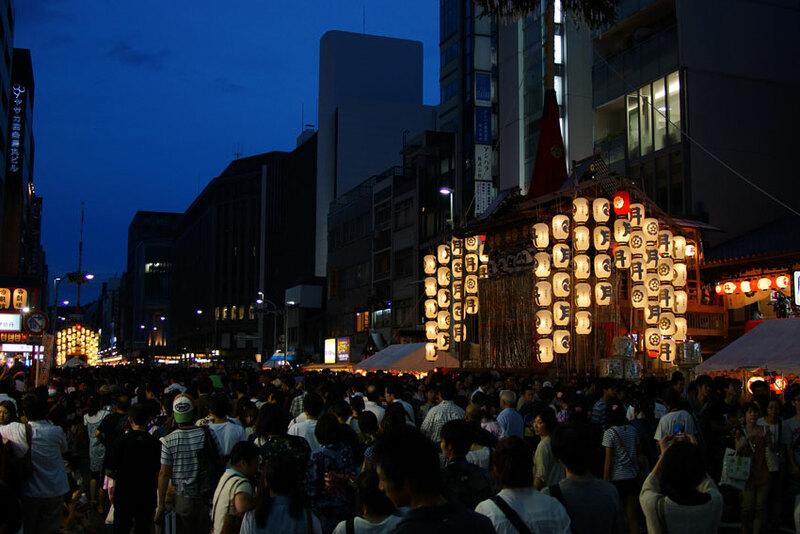 2014, then, marks the opportunity to enjoy twice as much of the ebullient atmosphere that makes the Gion Matsuri one of Japan’s most memorable cultural experiences. How to get there: Kyoto is most easily reached from Tokyo by Shinkansen—a Nozomi or Hikari train will get you there in less than three hours. Trains leave every 5–10 minutes. The starting and ending point of Gion Matsuri is Yasaka Shrine (see map below), and the processions and main events of the festival can be found to the west of the shrine.